There's no better way to celebrate the arrival of autumn than by heading outside with your kids for some fun fall outdoor activities. Play the old standbys, try some new games and activities and visit local farms, parks or other attractions to experience the best of the season. 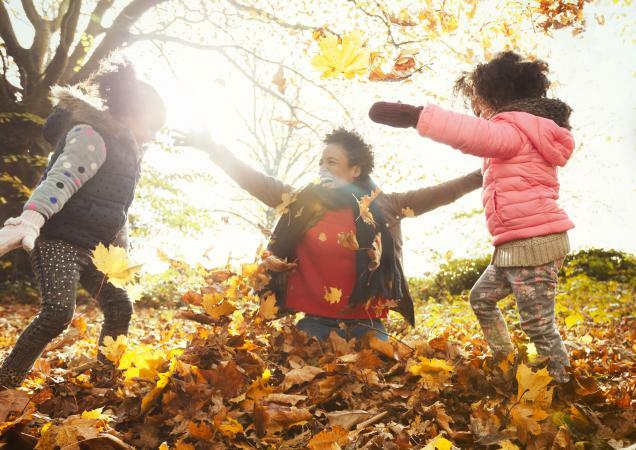 The changing of seasons is a standard seasonal experience for most kids, so make this autumn more exciting with new outdoor family games. In this minute to win it style game for kids, each participant will need to use a pair of chopsticks (two thin twigs) to build a tiny tree. Each person starts with a small branch that has a y-shape at one end and five leaves. You get one minute to use your chopsticks to place the y-shaped branch so it stands up out of the ground (y-shape facing up) then attach all five leaves to the y-shaped branches so they don't fall off. Create a fun relay race where each player has to walk to a specific target and back to the starting line while keeping a leaf in the air using only their breath. Players start by placing the leaf on their mouth then keep it in the air by blowing at it. You'll want to choose light, smaller leaves and make sure the target line isn't too far from the starting line. You've probably heard of Frisbee Golf, but never Frisbee bowling! Set up six small sticks, large leaves, or stacks of rocks in a bowling pin formation. Players must then toss their Frisbee from the other end of the yard to knock down or break your makeshift fall bowling pins. As with regular bowling, each person gets two tries on a turn. Keep score to see who ends up with the most points for the win. Gather a bunch of apples, variety and size don't matter. You'll also need a timer and one person designated as the referee. Players all start with piles of apples within reach. Set the time for one or two minutes and see who can build the tallest stack of apples that stands for five seconds on its own. Players can stack apples using any technique they can think of, but the stack can only use whole apples for supports. If you don't have apples on hand, choose another fall harvest item like mini pumpkins. You can play this group game on a walk, hike or in your own back yard with just a few sheets of paper and pencils. Players take turns calling out an object they see nearby by saying "I'm going on a walk and I'm taking..." All the other players must look for that object then run and touch it. Once every player has had one turn for small, young groups or two turns for larger, older groups, each person must write down all the items named throughout the game. The person who remembers the most items in the correct order is the winner. The cooler temperatures and changing colors make outdoor fall games for kids tons of fun. If you have several children at your house, why not have an old-fashioned apple bobbing contest? Fill a large bucket or tub with water and delicious, red apples and set it on a picnic table. 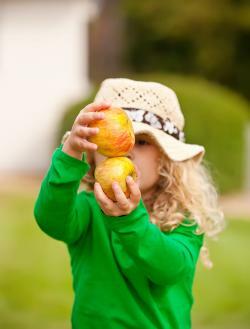 Let each child try to catch an apple with his teeth. Be sure you supervise the children, never leaving them alone with the bucket of water. Give each child a pumpkin and see who can reach the finish line first by rolling his pumpkin across the lawn with his feet. Alternatively, if you live in a hilly area, place some round pumpkins at the top of a gentle slope and watch them roll down. Younger children can also take turns following the pumpkins' path by rolling through some leaves. If you have plenty of trees in your yard, try holding off on the raking until the leaves have all fallen. Create a maze for children to meander through by raking the leaves into a maze of paths across your yard. Place a small prize such as a lollipop in the center to spur them on through the trails. What child doesn't love to jump into a pile of leaves? Tackle your yard work and entertain your kids at once; rake up several piles all over the yard and let your children have a ball. Create an obstacle course by either setting up items in the yard, such as cans, boxes, and hula hoops, or by using the items already in your yard, like swing sets, trees, bushes, and outdoor furniture. Be sure and tell the kids the order of the obstacles (you can label them if you like). Then, time the kids to see who can travel over the course the fastest! The cooler weather and crisp air that follow a muggy summer can inspire the whole family to get out and enjoy the outdoors. If you have older children and a hand-held GPS device, try geocaching. Fall is the perfect time for this because it gives the whole family an opportunity to take a look at changing leaf colors while you hunt for the cache. To take part in the cache hunt, visit the geocaching website to find the coordinates to a cache in your area. Program your GPS and set off. Don't forget to bring a trinket to leave behind you when you find the treasure. 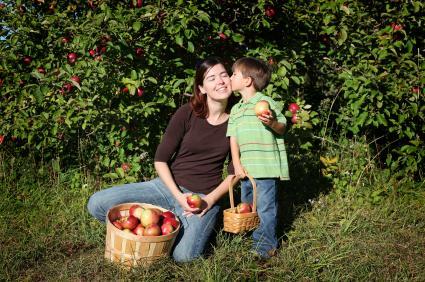 If you live near an apple orchard or a pumpkin patch, take your kids out to pick the season's fruit. Once you bring them home, you can have fun baking, carving or making fun apple head sculptures and Jack-o'-lanterns. Fall is a great time to head out to the local farmer's market, where you will find a full harvest of local produce. Many markets also offer outdoor entertainment. Make a family day of your visit. Find a wooded area, city park or another nature-rich area near your home to take your kids to and enjoy the changing of the seasons. Have each child bring a small notebook of unlined paper, a few crayons, and pencils. Once you set off on your walk, ask your kids to note anything that seems different than it was in the summer, such as changing leaves, cooler temperatures, a need for a jacket or falling acorns. Kids can also make leaf rubbings by placing a leaf beneath a sheet of paper and gently rubbing a crayon over it. Are your kids already bored, claiming there is nothing to do? How about involving them in some fall crafts? Invite the neighbors, and hold a contest to judge the best, most unique, or even ugliest crafts! You can award prizes such as gift certificates for ice creams or video games, or hand out small pieces of candy, inexpensive, plastic medallions, or gold candy coins. Doing the crafts outdoors can make clean up easier. You'll need some cording or string and a needle. Head outside to gather acorns and seeds from vegetable stalks, flower pods, trees, etc. Let kids string their treasures onto the cording to create seed necklaces and bracelets. Send the kids outdoors to gather an assortment of sticks for this project. The sticks should be from 9 to 12 inches long. You'll also need string. Begin tying the sticks together, joining them at the bottom and at the top. Keep adding sticks until the circumference of all the sticks fits around your kid's head. Pull the ends together and tie. If the sticks scratch your little guy's head, glue a piece of felt to the inside of the stick hat for padding. 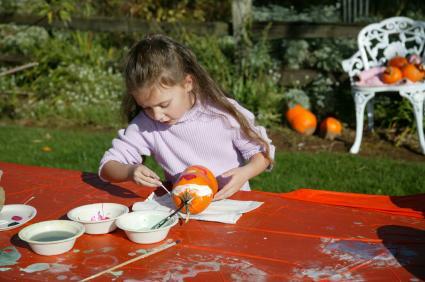 Have a pumpkin painting party by giving each child his own pumpkin and supplying plenty of paints for decorating. Doing this activity outside allows kids to be creative, and you won't have to worry about getting paint all over the house. Remember to set your finished creations out on the front stoop for everyone to enjoy once you're done. Kids outgrow clothes so quickly that you probably have some old pants, shirts, and shoes lying around the house. Gather these up along with a pair of pantyhose. Tie off the sleeves and legs of the pants, and stuff leaves into the clothing to create a scarecrow version of each child. Stuff one leg of a pair of pantyhose for the face, and decorate with markers, yarn or a hat to finish your creation. Prop him up by the front door with some cornstalks and pumpkins for a fun fall scene. No matter what activities you and your child engage in this fall, be sure to have fun together and to take some photographs. 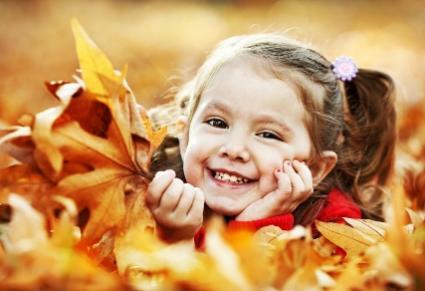 You'll be making memories that will last for many seasons to come and your child will also learn a few facts about autumn by participating in these activities.